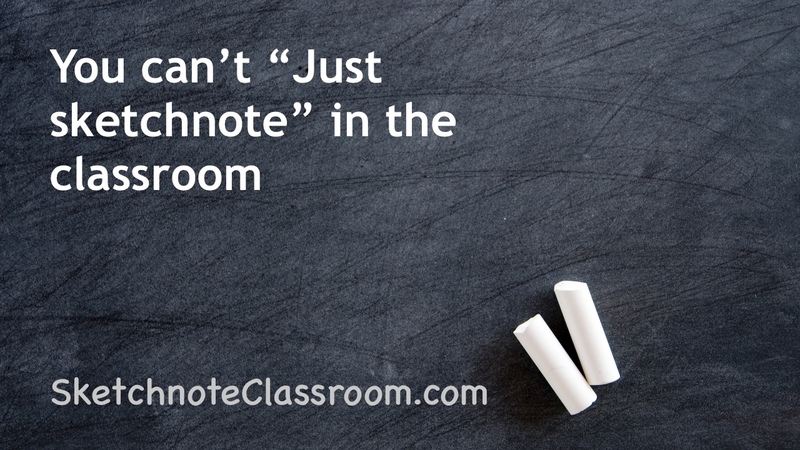 You shouldn’t “Just Sketchnote” in the Classroom. One of the ideas that I think I’ve picked up on in sketchnoting circles is that teachers should just “start sketchnoting” in their classroom. I’ll admit that this might be my misinterpretation of what people say (sometimes we read into things what we want to hear) but I felt like this has come up in a few places, so I suspect that this isn’t just me. I believe this is a misguided belief born out of good intentions and I hope that this post will lay out why we can’t and shouldn’t just sketchnote in the classroom but I still believe that sketchnoting has a place in the classroom (but not neccaserily THE place). The main issue that I have is that this belief that we should start using sketchnotes seems to lack any pedagogy. It simply states that sketchnoting is better for memory (which seems valid) and suits different learner types (erm, learning types is probably a myth, but suiting different styles does seem to benefit all students so…I guess that’s okay?) and it’s good…so do it. This doesn’t consider the competing theories we have about how knowledge is acquired or how we teach in practice. In the past we used to teach via passing on knowledge from a source of knowledge (the teacher and later possibly textbooks) and students had to listen and make notes. Now we have different theories which are competing for favour but they generally have left this idea of “the teacher as the source of knowledge who instructs the students” to a model where the teacher is a guide and helps the students to find out what they don’t know. This might not sound very different, but in practice it can lead to students discovering something the teacher doesn’t know and generally favours more project work and learning as a group. This is not a universal truth, some schools don’t follow these ideas and some politicians insist that these are bad (sometimes with good reason), but sketchnoting isn’t an immediate fit into a class which isn’t another form of a lecture. I’m not saying that these classes can’t be sketchnoted or use sketchnotes, but it’s not a simple 1 + 1. Thought and consideration needs to be given. Is it worth getting students to create separate sketches as they write up a report, or should they use sketches in their report, or should they sketch after the report? There are possible merits to each but we need to back these up with teaching knowledge. Who is supposed to sketchnote? The teacher or the students? Linked into that point, there is a question of who should sketchnote in the classroom? The teacher or the students? If it’s the teacher then why not just use infographics and pictures in the students text books (or the type of board work that teachers have done for years). If it is the students, then what about students at a young age who struggle with their motor skills. I’m not saying they shouldn’t sketch, but you need to consider these things (as teachers do) and not just tell a teacher to “start sketching”. Conversely, older students (such as late teens and adults) might have an adverse reaction to the idea of sketchnoting in class (viewing it as a waste of time or something they can’t do) and as such we may need to work on subtlying introducing sketchnoting into their practice. Ultimately they may not choose to work via this style and that is something which a teacher may have to accept. After all, their job is to teach their subject, not teach sketchnoting. Sure it might help teaching, but it is a means to an end not the ends in and of itself (this is what just sketchnote promotes). The way we teach different subjects varies depending on their content and skills required. For example, I didn’t read much about the history of the mathematicians who’s theories I learnt about in school. Paradoxically, I learnt (and read) a heck of a lot about the lives of different political theorists as it influenced their theories. With maths, I followed example exercises to understand how to do certain equations, with German I read texts and then had to identify the words which meant different things within the text. Different subjects require different things to be taught and in different ways. In some cases we need to apply sketchnoting differently and we may need to use different systems or set ups to do so. There are also constraints within classrooms. These can be practical and physical (we don’t have any desk/enough paper/pencils etc) or imposed constraints (“follow the syllabus to the letter.”, you can do whatever you want but make sure you cover all the material (which you don’t have enough time to cover as it is). This is a terrible excuse, I agree, but when you find someone in this sort of situation, it’s hard to persuade them to do anything “extra” even if it could save them time in the future. But how can teachers start using sketchnoting in the classroom? Despite saying all those points, I believe teachers can and probably should use sketchnoting in the classroom (at least as an option for students). As such, here are a few ideas for how a teacher can start brining sketchnoting into the classroom. Some sketchnotes could also be described as handmade infographics. These can be used to introduce ideas and demonstrate idea or concept. 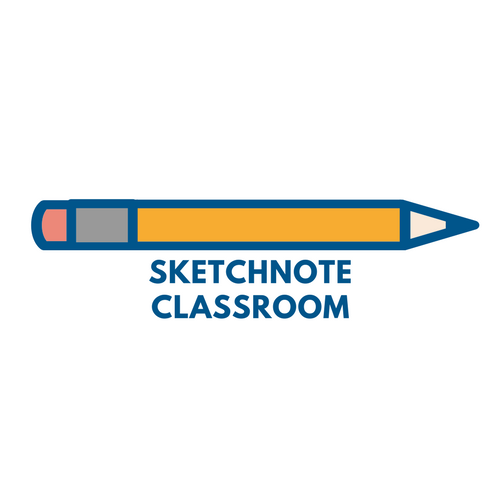 By presenting sketchnotes, they may encourage students to experiment with making their own sketchnotes and it provides a regence point for activities where a teacher encourages students to create sketchnotes. Instead of getting students to dive in at the deep in, we should instead start with single activities and build up to using sketchnotes more and more. This might be starting with just sketching an icon for a group of words they learn. It might be sketchnoting a short audio recording, video or book that they have to digest. It could be summarizing the lesson at the end of the class. In my experience, this has helped my students get into sketchnoting the most. All we do is provide some guidelines or framework for their notes during the lesson. (I absolutely stole this from Dana Ladenburger) By providing a framework, we give guidelines as to what our students should write and sketch and where. They can then focus more on the content and how it fits within these guidelines. Furthermore, we also provide some insight into the lesson content and what they should pay attention to. Check out the verbal to visual video on the cornel notetaking method. There are lots of different elements of sketchnoting and introducing them all at once can feel very overwhelming. It might be better to introduce one step at a time and then get students to try to incorporate more as they go along. For example, maybe you start with focusing on different types of text, a heading, main text and call out text. Then you might add in dividers and content blocks, perhaps you’ll add icons next and so on. This helps break sketchnoting down into different skills and highlights different aspects that students who “can’t draw” might be more drawn (pun not intended) to. I believe it is also good to present students with the option of sketchnoting and not necessarily enforcing it where we don’t need to. Providing the option can help build intrigue and allow the students who are naturally drawn to sketchnoting to try it. Meanwhile, the students who are uncertain can simply notice what the other students are doing increasing their interest which may lead to them experimenting with sketchnoting later. This is a bit of a cheat but the book Visual notetaking for educators has some useful ideas for sketchnoting in the classroom as well as a lot of the evidence for why sketchnoting can help students to learn more effectively.